Chick-fil-a is one of the most delicious fast-food restaurants you can find. Now you can make some low-carb copycat Chick-fil-a grilled nuggets at home! WHAT ARE LOW-CARB COPYCAT CHICK-FIL-A GRILLED NUGGETS? 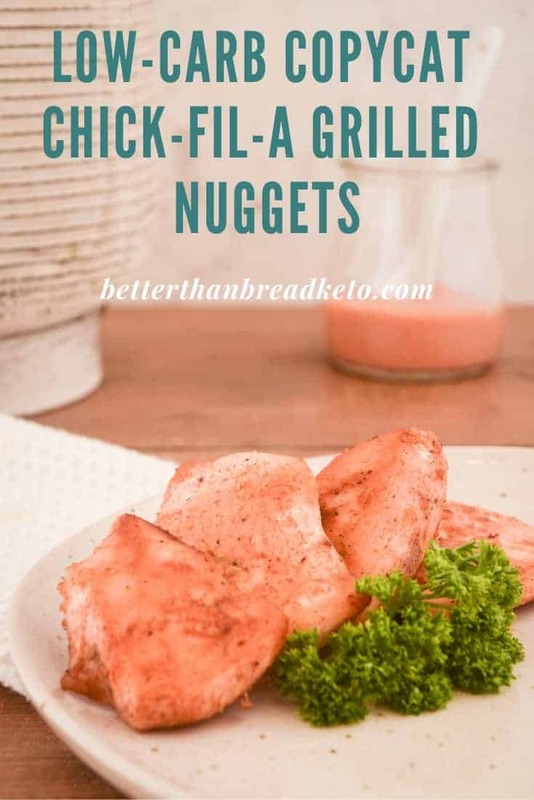 Low-carb copycat Chick-fil-a grilled nuggets are a take on the grilled nuggets served at the popular fast-food chain, Chick-fil-a. Though they seem healthy low-carb on the outside (they are grilled and all), they actually contain quite a few added ingredients and fillers. True, the restaurant variety contain 2g of carbohydrates according to their online nutrition info, but why not have a delicious recipe you can make anytime for your friends and family? 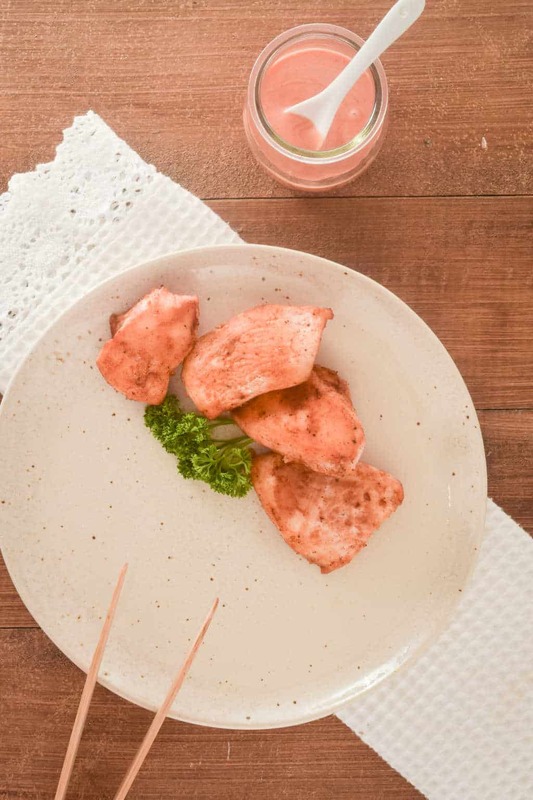 With this recipe, you can now make a copycat version of these delicious grilled chicken nuggets anytime you want! Okay… Seriously? SERIOUSLY!? Are we really having this conversation right now? Alright… If we must. To quickly bring everyone up to speed… Chick-fil-a is a fast food company headquartered in the state of Georgia. They’ve been in business since 1964 and specialize in anything and everything chicken. The cornerstone of their business is their fried chicken sandwich, topped with two dill pickle slices, and waffle fries. If you’ve never eat at one (or heard of one, for that matter) their food is very good but pricey, in my opinion. The bad news is, you won’t find much on their menu that is low-carb, much less keto. And last, but not least, don’t forget… Whatever you may ask of a Chick-fil-a employee, it’s their pleasure. WHY CAN’T I JUST BUY THESE GRILLED NUGGETS THERE? Well, you can if you want. However, the grilled pieces of chicken you get when you order aren’t as simple as you may believe. Even though these ingredients are added to the chicken in relatively tiny amounts, the point is it’s no longer chicken. The ingredient I expect to find in chicken is well, chicken. So yes, you can easily go to your closest Chick-fil-a and order the nuggets. However, know you are eating ingredients in chicken that aren’t supposed to be there. Make your own at home and know exactly what goes into them. They are just as yummy and more importantly, are the real deal! After you have these ingredients, read on below to find out exactly how to make this recipe! If you’d like to make these nuggets Whole30 or Paleo approved, read below for information on how to tweak the dill pickle/heavy cream brine to make this a reality. Begin by preheating your oven to 450˚F. Cut the chicken breast into chicken nugget sized pieces. In a large mixing bowl, combine the heavy cream and pickle juice; add the chicken pieces. Let the chicken marinate for 45 minutes to an hour. Be careful not to let it marinate too long or it will have a very strong dill pickle taste from the dill pickle juice. Using a strainer, strain the marinade from the chicken; discard the marinade. In a separate mixing bowl, mix the spices into the drained chicken. Spread the chicken nuggets onto a baking sheet with a silicone baking liner. Bake in the oven for 10 – 12 minutes or until the nuggets begin to turn a light golden color. Alternatively, you can cook these nuggets on a grill just like you would cook any other chicken recipe. You can find more information on alternate cooking methods below. Remove from oven and let the chicken rest a few moments before serving. Gobble down and enjoy! Yes, it’s true. The dill pickle juice imparts a delicious flavor to the nuggets. 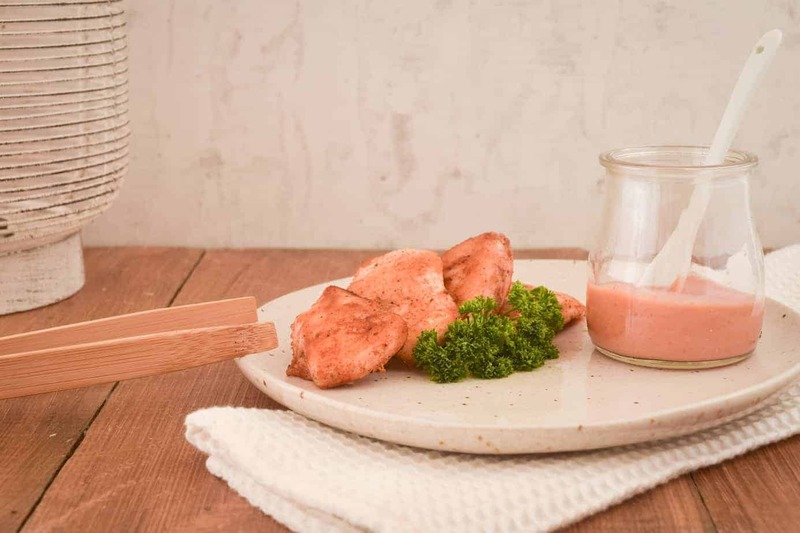 The salt in the juice is able to “dig down” into the meat, bringing out the flavor of the chicken during cooking. In fact, dill pickle juice makes a great chicken marinade in general, not just for these nuggets. And, if you’ve had Chick-fil-a chicken in the past, know that they brine all of their chicken in dill pickle juice before cooking. Cooking these nuggets in the oven is probably the easiest and quickest way they can be prepared. 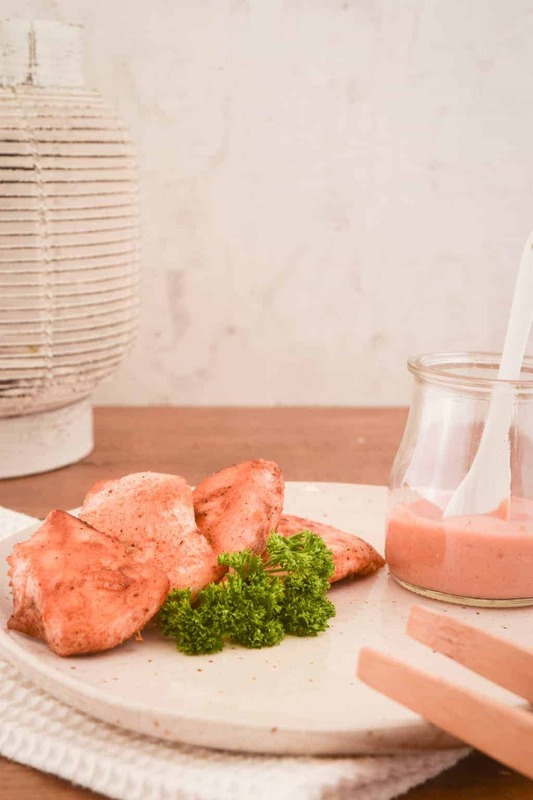 However, if you’d like to prepare them a different way or perhaps just don’t like using and oven, here are some alternative preparation methods for you. Outdoor Charcoal/Gas Grill – Using a charcoal or gas grill to cook these nuggets will not only get the job done, but also add a hint of that smokey, grilled taste we all love. To do this, preheat your grill to approximately 400˚F (since we are talking about different heat sources, we will lower it from the recipe) and place the chicken nuggets on. Grill each side for a few minutes and voila; true grilled chicken nuggets! Skillet – Cooking these nuggets in a skillet is another option. If you decide to use this method, make sure to give the skillet a nice brush with butter or coconut oil so the nuggets don’t easily stick. Cook the nuggets on medium heat, so as to not burn them, and ideally, turn them only once. Griddle – If you want to use a griddle to cook these nuggets, follow the same instructions as above for the skillet. Greasing the cook surface and not cooking them on too high of a heat is imperative. Again, it would be ideal to only turn the nuggets once during cooking. This helps to cook them more evenly. Air Fryer – Last, but not least, making these nuggets in an air fryer is another option you might be interested in choosing from. Pre-heat your air fryer to 450˚F and place the nuggets, single layer, into the basket. Make sure not to overlap them or they will not cook evenly. Cook for 5 – 7 minutes and check them. Give them a toss around for good measure, then cook a few minutes longer. Remove from the basket and serve! If you have an idea for a cooking method other than the stove and you’d like to share it with us, let us know in the comments below! ARE THESE GRILLED NUGGETS CONSIDERED KETO AS WELL? Unfortunately, no. 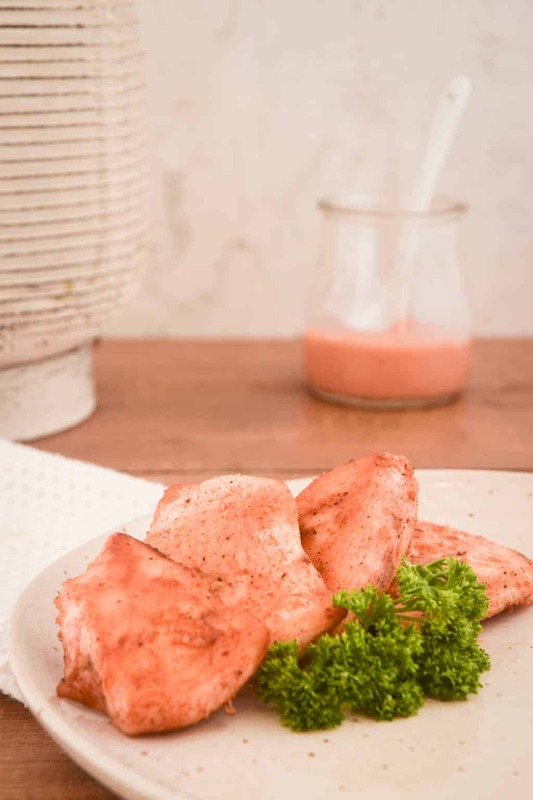 While they are low-carb and use heavy cream, the chicken used is still chicken breast, which is very lean and high protein. There simply isn’t enough fat in the recipe (the heavy cream is drained off, after all) for them to be considered keto. Having said that, using chicken thighs instead of breasts wouldn’t yield the same taste and texture you are expecting. CAN I USE THESE NUGGETS WITH A SALAD? Sure you can. Using these nuggets as your protein of choice on a nice leafy green salad would be a great idea. You will still get all of that wonderful, delicious copycat Chick-fil-a grilled nugget taste with the added benefit of leafy greens. If you’re looking for a good salad dressing to bring the salad together, try our Keto Parmesan Pepper Vinaigrette. It is delicious and has the distinct tastes of parmesan cheese and freshly ground pepper all packed into one salad dressing. If that doesn’t work, take a look through all of our salad dressing recipes to find one you like! WHAT SHOULD I DIP THESE GRILLED NUGGETS IN? There are plenty of easy dipping options out there. Our favorite is our simple Keto Dipping Sauce, which combines no sugar added ketchup, mayonnaise, and fresh-ground black pepper. You can also take a look at all of our sauce recipes for some more ideas! Beyond the low-carb aspect of these nuggets, this recipe can also serve as a Paleo and Whole30 version. If you aren’t familiar with either way of eating, here is some quick down and dirty info to familiarize yourself. The Whole30 philosophy revolves around eating foods that are not considered “triggers” for a period of thirty days (hence Whole30). “Triggers” are considered to be any foods that might trigger a reaction in you, be it a runny nose from soy or upset stomach from cheese or gluten. The premise behind the thirty days is that it gives your body time to react to not having these foods, so when you start incorporating them back into your diet you can more easily pinpoint which might be causing concern. Generally, most people find that as they incorporate the foods back into their diet, they are able to identify a trigger food and stay away from it to feel better. IS WHOLE30 ALSO KETO AND LOW-CARB? While a great and generally “clean” way of eating, Whole30 is not keto-friendly or low-carb. While yes, the diet requires the removal of grains from your diet, Whole30 allows foods that contain carbohydrates. Such foods are fruits and starchy vegetables, like potatoes. HOW CAN I MAKE THIS RECIPE WHOLE30? To convert this recipe to Whole30 standards, skip brining the nuggets in heavy cream, since dairy isn’t allowed. The paleo way of eating is similar to Whole30. Once again, the premise of the diet revolves around eating real, unprocessed foods. The diet is designed to resemble what human hunter-gatherer ancestors ate thousands of years ago. By following a whole food-based diet and leading physically active lives, hunter-gatherers (presumably) had much lower rates of lifestyle diseases, such as obesity, diabetes, and heart disease. Like keto and low-carb, this way of eating often leads to weight loss without the need for strict calorie counting, and other health improvements. IS PALEO ALSO KETO AND LOW-CARB? The general misconception is that paleo is in fact low-carb, since it is grain and sugar limiting. However, this is definitely not the case. A great rule of thumb to follow is… Paleo doesn’t mean it’s low-carb and low-carb doesn’t mean it’s paleo. There are plenty of foods and products allowed on paleo that are stacked with carbs. Can paleo recipes be low-carb? Sure. Can low-carb recipes be paleo? Sure. Doesn’t mean they are synonymous, however. Much like Whole30, paleo requires the removal of added sugar, grains, legumes, and dairy. The diet is also void of any processed foods (odd since there are tons of processed paleo options out there), as well as artificial sweeteners. HOW CAN I MAKE THIS RECIPE PALEO? Just like the Whole30 variation, the removal of the heavy cream in the brine should suffice to certify this recipe as “paleo.” Just like Whole30, dairy is not an allowed food. Just keep in mind, much like paleo and Whole30, gluten-free doesn’t mean it’s low-carb. However, low-carb does mean it’s gluten-free. There are lots of yummy and delicious sides to eat with these low-carb copycat Chick-fil-a grilled nuggets. 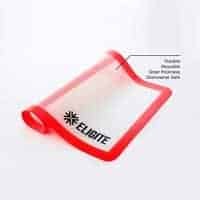 Silicone Baking Liner – If you’ve never used a silicone baking liner to line your baking sheet, you are in need of one immediately. You may have also heard of these before referred to as Silpat. These liners make cleanup incredibly easy and there’s no more sticking to the pan! Chick-fil-a is one of the most delicious fast-food restaurants you can find. Now you can make some low-carb Chick-fil-a grilled nuggets at home!